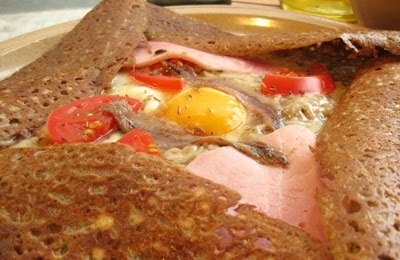 The best crepes in the Marais can be found at Breizh Cafe. The crispy, chewy buckwheat crepes are filled with fresh, seasonal ingredients. We had the Provencal which was stuffed with ham, cheese, tomato, onion relish, anchovies and one perfectly cooked sunny-side up egg. It was fantastic. We followed it with a sweet crepe- bananas and caramel. Here is David Lebovitz's review.